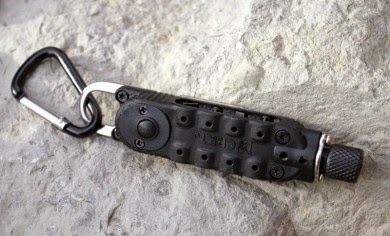 Recently CRKT has released a whole set of very innovative and useful pocket tools named I.D. Works. Some such as this CRKT Get-a-Way Torx Driver is even TSA compliant since there is no knife. If you are in a trade which has a frequent need for a pocketable Torx bits set and tool, this could be a nice tool kit to pick up. As a certified knife nut, there are times where I need to remove or adjust a clip or knife blade tension and of course these tools can come in handy tinkering with AR15s. Usually this requires some type of Torx bit to do it, so I thought this would be a handy little tool to add to my range bag tool kit. CRKT - Columbia River Knife and Tool was founded in 1994 by Rod Bremer in Oregon. By working in unison with the top knife designers around the world, CRKT delivers a broad line of innovative custom knife designs in affordable production knives and tools. The result is that the hottest custom designs are available to the consumer for daily use at affordable prices. The patent pending Get-A-Way Driver Torx Was designed by Launce Barber and Tom Stokes. The Get-A-Way Driver Torx features four standard high quality Torx sizes, T5, T6, T8 and T10. Each of the torx bits has a spring-loaded ball detent to keep it in the holder, and a nail-nick groove to help with bit removal. The bits can be used with the bit adapter, or even as an angle driver and if you need a little light to see what you are doing, you can use the on-board LED light. If you want to use any of your own hex bits, you can use them with this wrench and even swap out and customize which bits you want carry. Other features include an oxygen bottle wrench and 10mm wrench with hex bit reliefs. 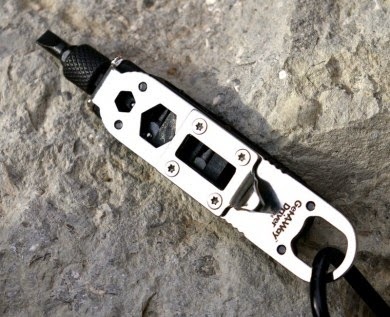 The removeable pry bar can be used for a variety of tasks including bottle opening. 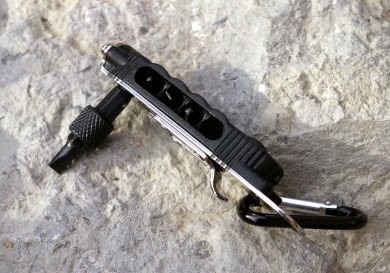 For $19.99 retail and even less street priced, this is an awesome little tool which packs a ton of utility into a small and inexpensive package. CRKT does a great job with their knives and the other side of their business the Columbia River Knife and “Tool” part. I have actually picked up a second one of these which I have completely customized with hex bits. Between the two Get-a-Way Driver Torx tool, I can accomplish pretty much any tinkering or tightening need requiring drivers I may have while out in the field.